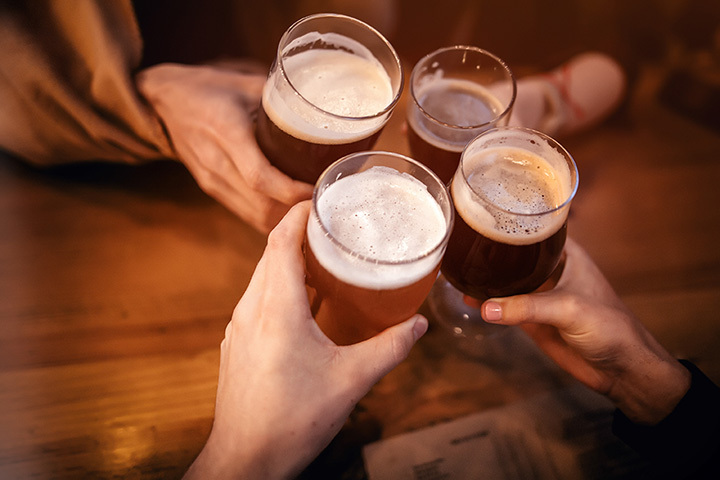 Enjoying a sip of your favorite brew among friends is a good feeling. But enjoying it in the great outdoors might be even better. Beer gardens provide this optimal atmosphere for unwinding after a long week. From Westerly to Providence, here are a few of the best beer gardens in (and around) Rhode Island! You might easily mistake this American bar for an authentic German beer garden, what with the gourmet soft pretzels, rotating list of craft beers, and lots of riverfront patio seating options. Plus, with 41 craft brews on draft, a game room, a convivial atmosphere, and bratwurst choices on the menu, you might just think you have landed in Bavaria in the middle of the Ocean State. Another spot with a beer garden flare, Redlefsen features cuisine based on standard dishes from Germany. Plus, this waterfront spot celebrates Oktoberfest every Wednesday and Thursday night starting the last week of September and running throughout October. During that time, you will find lots of German-style beers, lederhosen, German dancing, and accordion music. Based off from the idea of a traditional German biergarten, Bayberry is a modern American twist on an ancient German idea. And, pairing local beers with eclectic pub grub, is a new twist that lets diners choose chicken schnitzel sandwich or steamed littlenecks to go along with cold suds and communal seating. Sure, it can be intimidating at first, but you’ll find plenty of smiles and jovial conversations while enjoying your meal on these shared benches. Honestly, what modern gather spot speaks more to the ancient biergartens of Bavaria than the 20th Century trailer park? Like-minded residents sitting around at picnic tables with hanging plastic lighting while drinking beer in the out of doors is the idea that Ogie’s celebrates as their trailer park themed bar serves American bar food classics and cold beer in a jovial setting. Modeled after a small New England farmhouse brewery, Trillium was established in 2013 and uses local ingredients and wild yeast whenever possible to produce small-batch craft beer offerings. Plus, they just opened a beer garden in the middle of the Rose Fitzgerald Kennedy Greenway Conservancy park. The upshot, of course, is that now you can enjoy a cold brew under the sun with friends at any time during the summer. Established in 2010, Castle Island Beer is located in Norwood Massachusetts, but, as of this past summer, they have opened their first seasonal beer garden along the coastline at Constitution Wharf in Charlestown. It’s the perfect place to enjoy one their 12 flagship or seasonal beer offerings, while experiencing the cool ocean breezes blowing through your hair. Plus, lucky for us, they plan to be back next year. If house-made sausages, cold brews, and community tables sound like your thing your thing, then the Jealous Monk might be a place you want to check out. Offering bratwurst, schnitzel, burgers, and other beer garden grub, Jealous Monk combines the best elements of a European beer hall with the American additions of sports on every TV and live entertainment at night. Established in 2012, KBC Brewing is dedicated to the beer and lifestyle of Meistersdorf, Germany, where brews and community go hand-in-hand. Plus, their outdoor beer garden is set up in the style of the biergartens of old, with tents and community tables outdoors next to Webster’s French River Park and Riverwalk. You will also find live music on Saturday, and families are always welcome at this community-themed beer garden.